For the duck hunter, the woodland wanderer or the happy gardener, it’s all about their feet! Very few things can make you as miserable as cold, wet feet. I learned about these socks from the one-and-only Jerry Miculek, and later learned how they performed in the sloppy mud at a match in Texas where we sloshed through ankle-deep muck. At first, I felt slightly skeptical, but these things are MAGIC! At a cost of $25 to $35 per pair, these socks accompanied me through a muddy creek and my feet stayed dry. I could feel the cold, and while my shoes took the hit, my toes did not suffer. They’re a lot easier to pack in your bag than mud boots, and if you are in a bind to keep dry, they’re worth their weight in gold. Rabbit Fur + cold = Enough said. Keeping your head warm is as important as keeping your feet dry. We wear these hats when the northern winter brings bitter cold. 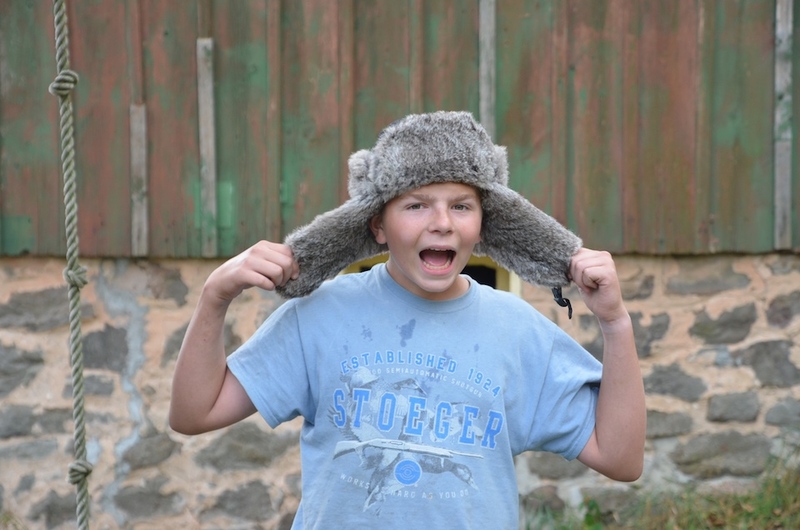 A nylon shell stops the wind while rabbit fur lining keeps your ears and neck warm. When the temperature dips below zero, I reach for this hat! From $46 to $99, these hats come in various colors, red plaid, a Realtree camo approach and even, leather. The little pieces are what makes a rifle your own, and finding the right pieces and configuring yours where and how you want them is a great winter project to plan for when you’re Christmas shopping. If you’re looking for something small that can be a big deal, think about giving your Secret Santa recipients gadgets for their guns. Things like sling attachment points and mounts for optics can complete a rifle nicely. 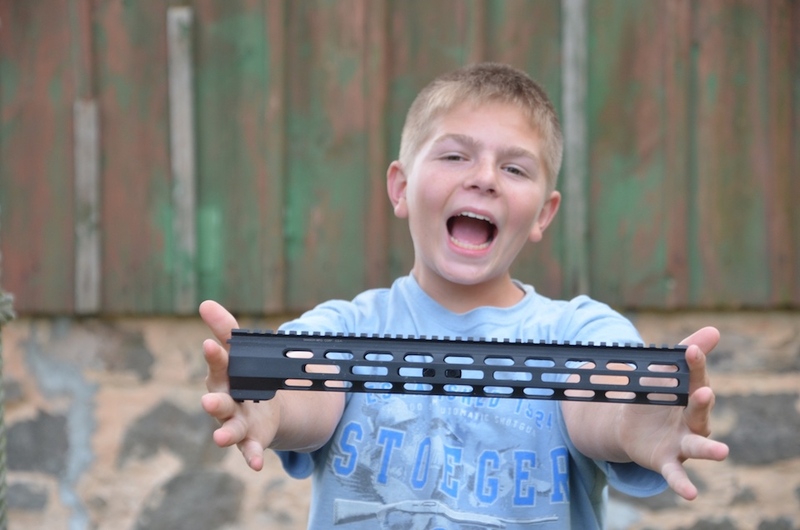 Maybe your kids enjoy shooting .22 and you splurge on a .22 conversion kit, or your daughter is going to hunt with you this year and you decide a smaller, lighter handguard is in order … you can’t go wrong with gifting some things that make shooting simpler. A few things I really like come from Samson Manufacturing, such as its QD sling mounts, with options in MLOK or Keymod, which are perfect for hunters who want to sling their rifles. And for optics, when you might want to move from one gun to another, its DMR scope and red dot mounts will make someone smile (while moving from one gun to another). Costs range from $27 to $195. 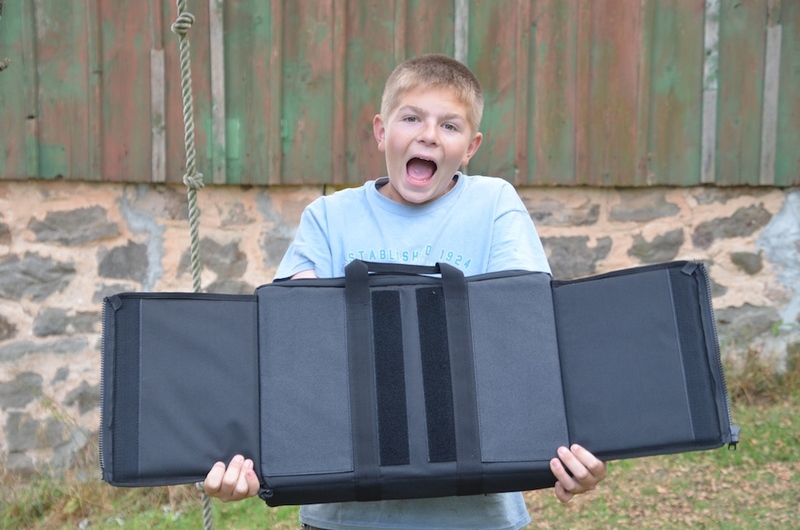 While this isn’t a gun, or too terribly outdoors related, this laptop bag offers something you might not consider when you shop for a bag, but maybe should – as it offers ballistic protection. The option to insert a ballistic soft panel, made by Vism, sold by Tactical Sh#t (edited by our publisher who doesn’t want us to use naughty words here), means you can turn your bag into something more if needed. At $99, this bag also features a mousepad that you can attach with Velcro to one side of the opened bag or the other, for a left- or right-handed workspace. The bag also comes with plenty of pockets to stash whatever you need. The back side also has padded shoulder straps that can be tucked underneath so you can keep your hands free to do other things. One of my favorite pieces of gear this year has been my DC FLT Luggage from 5.11 Tactical. With reinforced grab handles, locking zippers and hard corner protection, these bags are holding up to thousands of miles. They can be embroidered, and meet US carry on guidelines when not expanded. 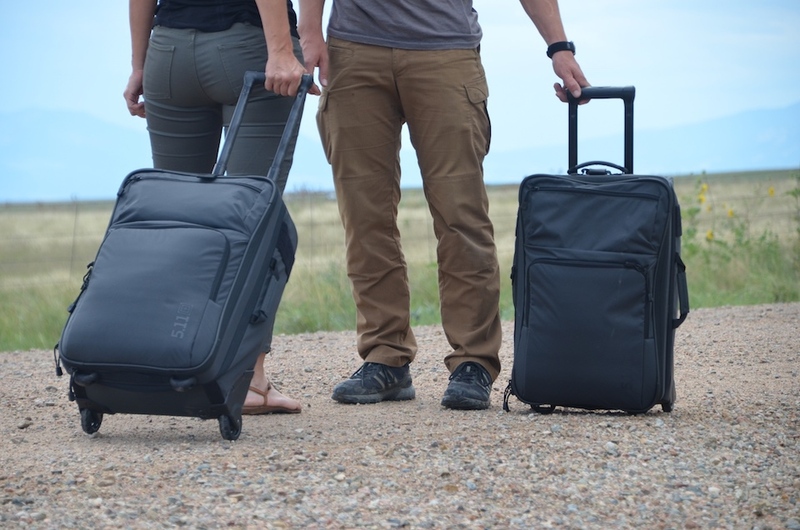 One of the best things about them is that the wheels are so quiet and smooth to roll They’re lightweight, but durable and I can fit enough clothes for 2 weeks inside. There’s a mesh bag I use to zip my socks inside, a mesh pouch on the inside of the lid for other small items, and the padded front holds my paperwork. I can even stash a pair of flip-flops in the small pouch on the front. The line runs from $104.99 to $159.99. A bag for all seasons and reasons. The Voodoo 56” 2 compartment gun case will take you guns places, along with all your other gear, and do it organized, in style, with shoulder straps to go! Last winter, while it was still a prototype, I got to check out Voodoo Tactical’s long gun bag with adjustable internal Velcro system and scabbard for long guns and pistol pouch. Designed with 3-gun competitors in mind, this bag also has a place for a family of shooters or hunters. Take your hunting rifles or shotguns in a single case instead of 2, and pack the chokes, cleaning gear, rifle bipods, etc., in the other pockets. It comes with comfortable back-pack style shoulder straps in case you need to trek your gear farther than from car to hunting cabin, and it won the “2017 Industry Choice Award” for “Premium Accessory” of the year. You can watch a video on YouTube showing this bag’s versatility. At $249, this bag makes the ultimate gun case for anyone travelling with several guns. 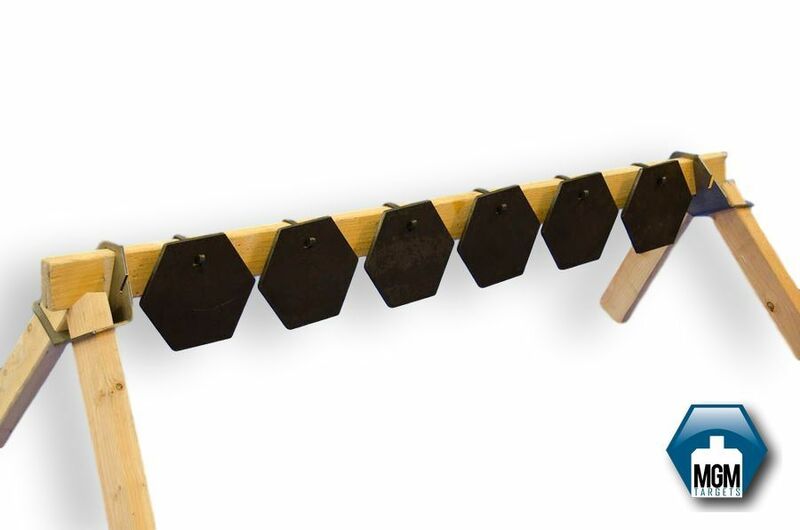 Pun intended, this plate rack will give you a lot of bang, clang and ding for your buck! Often when we find a place we can shoot, it’s a hassle to find access to targets that don’t require constant reset. This deal from MGM Targets comes with 6 plates, along with accompanying hooks for them, and 2 angle brackets that hold a cross-piece and legs. You need 3, 8-foot 2x4s. Two are cut in half for the legs, but with those, combined with the equipment that comes in a handy carry bucket, in less than 2 minutes, you have a plate rack to shoot that doesn’t require resetting. Currently on sale for $299. Pistol caliber carbines are bringing people to shooting a rifle-like firearm in a very fun way. Sometimes you need a Christmas gift that the whole family can enjoy. 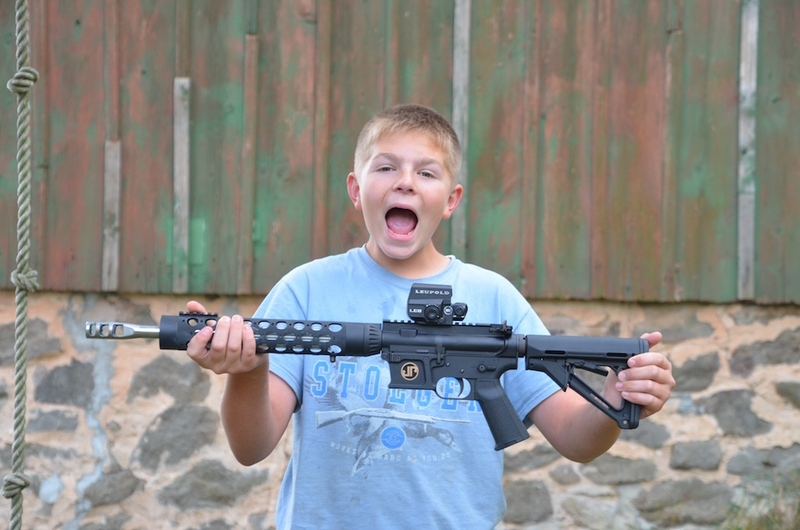 If you are looking to introduce your youngster to rifle shooting, but with a lightweight and low-recoil option, look no further than a 9mm pistol caliber carbine (PCC). JP Enterpises’s GMR-15 takes regular Glock magazines, and is built with parts and support from a US manufacturer. A PCC allows you to practice rifle skills when you don’t have rifle-rated targets or shooting areas. That means indoor ranges – which usually won’t allow you to shoot rifles indoors – may allow this type of firearm. These PCCs have a 3 MOA guarantee. But ours grouped better than that with under 2 MOA with 124gr Zero, HP conical bullets. This rings up at $859 to $1,699, so that’s why it’s for the whole family. 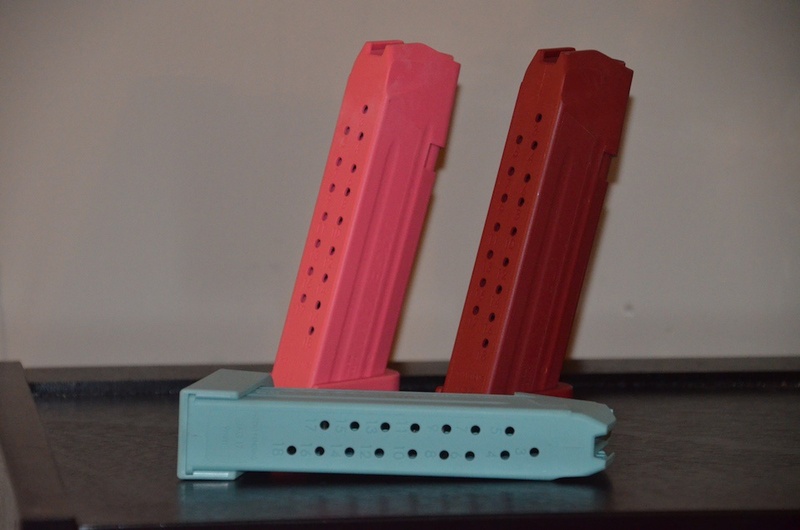 Being able to find the correct ammo, when you want it, is made easier with colored mags. Ones that are easy to clean and have an extended base pad to make reloads easier just make them that much better! If you own a Glock, these definitely have a place. The last item on the list will help your kids keep track of how many rounds of 9mm ammunition are theirs! These colorful Glock mags from Jagemann Sporting Group come in variety of colors and are designed for easy disassembly. They also have an extended base pad to facilitate easy reloads. These run about $16 and make a great gift for a junior shooter who likes to have colorful gear. Or, maybe you want magazines for your pistol and now, you can color code to keep things simple and ammo types separate. Let us know if you have any other suggestions for cool shooting gear this year for tactical Christmas gifts.